This book provides a significant and insightful exploration of the so-called 'theological turn' in contemporary French thought. The philosopher Jacques Derrida speaks of a deeply ambiguous desire to 'save the name' of God in his work on negative theology, and this desire resonates in different ways in the work of his contemporaries. This turn to religion within the work of a group of thinkers who have been stereotypically identified as relativists or nihilists prompts a series of questions which form the background to this study. Negative Theology and Modern French Philosophy advance a reading of negative theology as an ancient name for something that is essential, not simply to modern French thought, but to all responsible thought and action whatsoever. 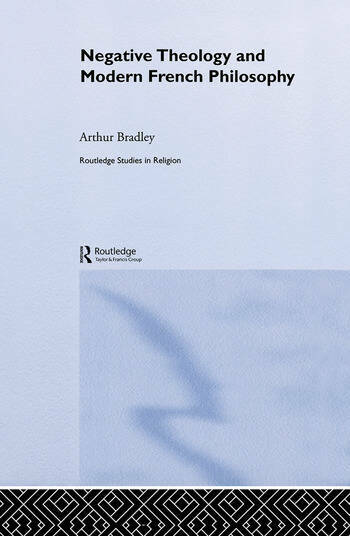 It will be of essential interest to theologians and philosophers and will also interest those concerned with the work of Derrida and his contemporaries.